In this hyper-political age we’ve seen what seems to be an almost unending debate among the political class of this land over the highly charged topic of immigration reform. Countless hours are spent arguing whether this person or that person should be allowed citizenship for this country, whether still others should even be allowed into the country at all, and of course whether or not we’re giving some “a free pass” to citizenship. But what we have not seen, my friends, is the much more important question addressed. Should these people be able to bring their monsters with them? Because, let’s face it, until this is addressed they will continue to come and eventually you will be faced with a kill or be killed situation with a creature that doesn’t follow the rules as you know them. Since we can’t count on legislation, we’ll have to turn to education. To that end, this series will give you the basics on the monsters that you only think you know but in fact play by other cultural rules. Today’s monster is the Chinese vampire. The vampire may well be one of the most misunderstood monsters in modern pop culture. And by misunderstood, I don’t mean that they just want to be liked by people or find hot high school girls to love them. No, I mean that they’re misunderstood in a much more dangerous way. You see, the modern presentation of the vampire has led many to believe that there are 400 ways to kill a vampire and that each and every way works on each and every vampire. This is not true. It’s bad enough that most people think that sunlight kills every vampire in the “Dracula” mold, but there are vamps out there who could care less about sunlight, including vampires in the “Dracula” mold, and still more that don’t care one wit about your stake or your cross and would gargle with your holy water before spitting it in your eye and laughing at you. Or ripping your head off. Whichever. 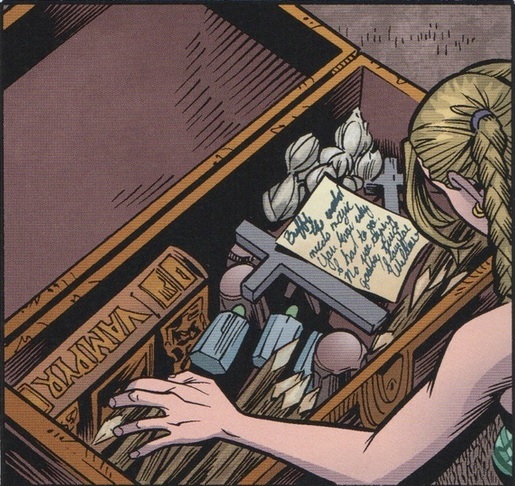 The contents of Buffy’s weapons chest: NOT necessarily the best ways to kill a vampire. We’ll start with the Chinese Vampire. While this creature is beginning to see a little more notice in American pop culture, it’s still not a widely known variation of the vampire, and misunderstandings and misinformation abound. Mention the Chinese vampire, also known as the chiang-shih or kiang-shi, and you’re likely to get confused looks from most while some will tell you about zombie-esque hopping corpses. While that’s not an altogether inaccurate description for some of the Chinese vampires of legend, it’s also not the entire story on them. One of the key components of the Chinese vampire’s origins is found in the belief throughout China that people have both a superior soul and an inferior soul. The inferior soul, known as the p’ai or p’o, was the soul that inhabited the fetus during the time of pregnancy and could linger on in the body after death. This act of staying on in the body of the deceased would create a state of unnatural preservation of the corpse that would continue on until the soul left and the body turned to dust. This was most often associated with sudden or violent death, either at the hands of another or self-inflicted. It might also come to pass due to a soul being angry over an improper or delayed burial. If this inferior soul was powerful enough, it could possess and animate the corpse and use it for its own purposes. This was then known as the chiang-shih, a blood-sucking ghost or vampire. Because of the act of preserving the corpse, the vampire did not show any outward signs of being anything other than a normal, living person, and its true nature would only be given away once it chose to strike. 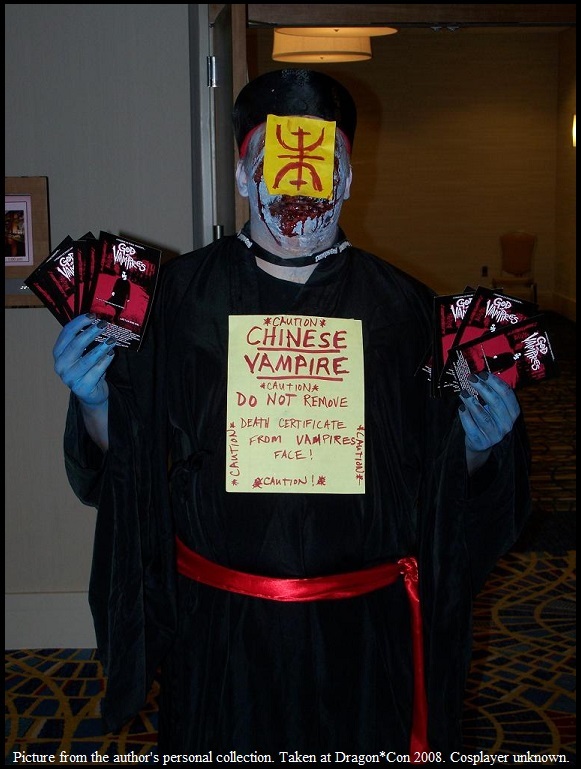 Most Chinese vampires are nocturnal by nature. While being very physically powerful, capable of ripping a man’s limbs off with ease, they are also, at early stages of their development, some of the most limited vampires insofar as supernatural powers and abilities. Put one in a coffin and under six feet of soil and it’s as stuck there as you or I might be. They did not possess the ability to transform from physical states to ethereal ones and back again nor could they dematerialize and rematerialize elsewhere. This was often an incentive for a speedy burial in many small villages. They are also without the power to entrance and hypnotize their intended victims. But what they lacked in the overtly supernatural, they more than made up for with the above mentioned strength as well as a vicious streak a mile long. They were also known to be in possession of a strong sexual drive that would sometimes lead them to target women for assault. Later stages of their development, however, brought on greater powers. With time, they could master the power of flight or of changing into animals such as wolves. With this increased power came physical changes as well. The most notable of these was the development of long white hair. 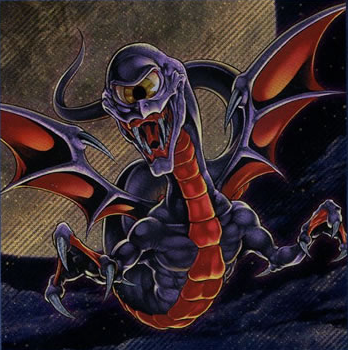 Other physical changes could occur, such as the physical deterioration seen with the hopping corpse, and there are even stories of powerful vampires that were dragons. Another less familiar trait of the chiang-shih to western vampire sensibilities is the fact that they are not always an entire corpse. The inferior soul can also take possession of just one part of a dismembered corpse. One of the more common versions of this is seeing a p’ai take possession of just a severed head that now moves around via the power of flight. While lacking the overall physical threats presented by an entire body, the dangers presented by having the ability to hide and strike from smaller and more concealed hiding places still makes this a dangerous variation to deal with. The ways that one might defend against these vampires while in their early stages are both familiar and unfamiliar to what most would consider traditional thoughts on the matter. The chiang-shih had problems with crossing moving water and found garlic to be repellant. They’re also rather averse to loud noises and can even be killed by extremely loud sounds such as heavy thunderclaps. While your holy water might not do much to bother them, salt was known to have much the same effect on them, burning and bubbling their skin quite nicely as well as inflicting pain. A mixture of iron filings, red peas and rice can be used to create a barrier by sprinkling it on the ground in an unbroken line. This can either be done as localized personal protection or can be used to encircle the vampire’s coffin; the latter either trapping him in place before he rises or preventing him from returning to the safe havens of his resting place. One way of stopping a Chinese vampire that has seen its place in American popular culture is the use of a charmed scroll. The charmed scroll is a small paper scroll with holy script written on it that is then blessed and can be placed on a Chinese vampire to immobilize him. Once it’s placed on the vampire, the vampire is essentially turned into an undead statue. One problem with this is that you often have to let it get right up to you to stick the charmed scroll on it. This means that it can get its hands on you. Not a good thing as once the charmed scroll is in place the grip it has on you is locked. Not too big of an issue if it grabs something removable like clothing or hair, but much more problematic if it has you by the wrist or neck. As such, charmed scrolls should not be used by the inexperienced, solo hunter. 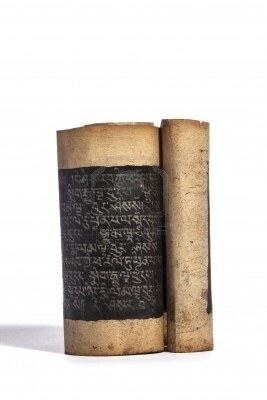 These scrolls are not exclusive to China, and there are usable variations of them throughout Asia. In China, ofuda are used in Shinto and Onmyodo. Taoists use a version of the charmed scrolls called Fu. In Buddhism and Hinduism they’re called Sutras. You also have Korean shamanism that uses a variation called Pujok. Once the Chinese vampire reaches the point of mastering flight and acquiring other abilities, the only ways to deal with it are by bullet or by somehow keeping it out in a storm and exposing it to lethally loud thunderclaps. And then, of course, there’s the ever popular standby of fire. Like so many other creatures of myth and legend, burning it until only ashes remain is usually considered the safest and surest way to put an end to it. The Chinese vampire can be seen on DVD in films such as Hammer’s The Legend of the 7 Golden Vampires, Hong Kong’s Mr. Vampire, and the indie horror/shoot ‘em up God of Vampires among others. The little scroll placed on the vampire is basically a Chinese death certificate. Realized I forgot to mention it.